The Landquart Designer Outlet mall in the east of Switzerland offers shoppers bargains and savings on prestigious fashion labels at factory stores. Shoppers can enjoy huge saving on top Swiss and European fashion labels at the Landquart Designer Outlet shopping mall in Eastern Switzerland (Graubünden) near Liechtenstein, Chur, Klosters and Davos – only an hour away from Zurich. In addition to top fashion brands, the Landquart factory stores also include some of the best Swiss sports and active leisurewear brands, which offer bargains to travelers en route to the mountain sports areas of Graubünden (Grisons). Transportation is easy by car or train – the outlet mall is directly next to the highway and Landquart railway station. Free train tickets are offered to some shoppers. Designer Outlet Landquart is on of the newest and classiest factory outlet shopping malls in Switzerland. Shoppers can enjoy huge savings in nearly a hundred shops on a variety of designer labels – many are top Swiss or European fashion brands. Designer Outlet Landquart follows the typical European factory stores concept. Rather than an enclosed shopping mall, the shops here are grouped like in a village without covered walkways between boutiques. The shops line a central street or long market square with parking lots at either end. 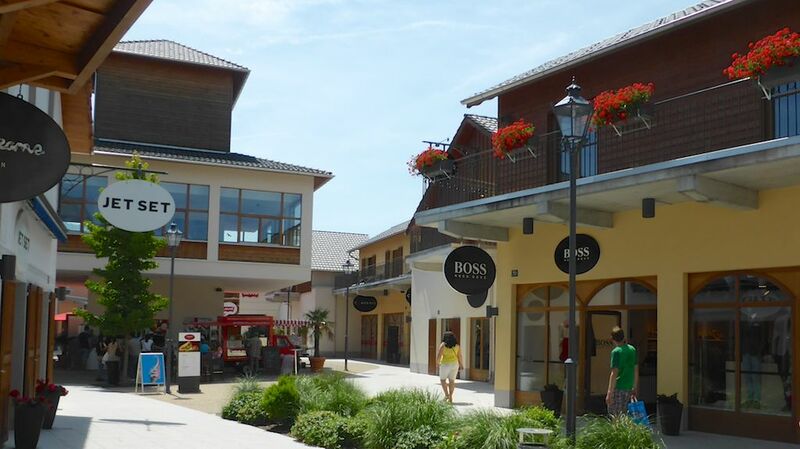 Some of the fashion labels with their own brand stores at Designer Outlet Landquart include: Barutti, Boggi Milano, Bogner, Calvin Klein Jeans, Calvin Klein Underwear, Desigual, Diesel, Hugo Boss, Jet Set, Lacoste, Levis, Max Mara, McGregor, Napapijri, Navyboot, St Emile, Tom Tailor Kids, Tommy Hilfiger, and Zero. Many further labels are sold in multi-brand stores. The mall also has a large Trachten Outlet selling traditional regional costumes, which are traditionally very expensive too. Particularly noteworthy is the large number of sportswear shops selling top active wear brands – mountaineering and related activities are hugely popular in this part of Switzerand. Top sports and outdoor brands with own stores at Designer Outlet Landquart include Billabong, Fox, Maya Maya, Nike, Oakley, Odlo, Quicksilver, Roxy, Rukka, Wellensteyn, and Zimtstern. The home and living stores at Designer Outlet Landquart are of interest not only to locals. Sure, good deals are available on pots and pans, glasses, cutlery and duvet covers, but many of the brands here also offer smaller items that make much more useful Swiss souvenirs than miniature cowbells or plastic cuckoo clocks produced in Asia. Wenger is a famous maker of Swiss army knives but also have many further classy items on sale here. WMF has many stainless steel items while Kuhn Rikon has some of the finest fondue sets in Switzerland. Further brands include Amefa, Bassetti, Home & Cook, Le Creuset, Möve and Schlossberg. Eating and drinking at outlet malls are often disappointing. However, like the fashion labels at Designer Outlet Landquart, the restaurants here are above average too. The main restaurant is Margaux, which offer quality food usually not expected at outlet malls. Unfortunately, the prices at the restaurants are Swiss standards, not outlet bargains. Further food options include various kiosks, a Mövenpick ice cream parlor and smaller snacks and meals at the Lavazza Cafe. Lindt has an outlet store with bargains on Swiss chocolates. Outside the mall itself, near the entrance to Landquart train station, is Ivan’s Bündner Spezialitäten de Luxe, which sells local specialty products from the Graubünder region of eastern Switzerland. Rather rarely for Switzerland (and the rest of the German-speaking world), the shops of the Designer Outlet Landquart are open on Sundays and most public holidays. Opening hours are every day of the week from 10 am to 7 pm. Non-Swiss residents could ask for the tax back claim forms at any participating shop. Follow the procedure to claim back some tax when leaving Switzerland. Sales tax in Switzerland is only 8% making the administrative procedure only worth it for larger purchases. Getting to the Designer Outlet Landquart, Tardisstrasse 20a, 7302 Landquart, Switzerland is very easy by car or train. The factory stores mall is directly next to the Landquart train station and the A13 autobahn. From the Autobahn A13, use exit 14 for Landquart. The Designer Outlet mall is directly next to the highway and well signposted. Driving time is around an hour from Zürich or St Gallen and much faster from Chur, Liechtenstein, Kloster and Davos. Parking (charged) is available at either end of the shopping mall village. On warm, or snowy days, it may be worth driving past the outlet mall and use the parking Süd (south), which has some parking spaces undercover. Free return train tickets are available to some shoppers. If arriving by train on the Räthische Bahn (i.e. trains from the south in the Graubünden region, not north or west on Swiss Railways SBB) and spending more than CHF50 at the outlet mall, the return train trip is for free. The original one-way train ticket to Landquart must be stamped at the Centre Information Desk for this to be valid. The Designer Outlet Landquart is a great stop when en route to the mountain areas of Graubünden (Grison) in eastern Switzerland. The classy boutiques of Chur, Klosters, Davos and St Moritz won’t have these attractive prices. Travelers en route to Tessin and Italy should also considering shopping at Foxtown Outlet Mall near Lugano and just a few minutes from the Swiss-Italian border. This may well be the best shopping in Switzerland – the high numbers of tour buses and cars with Milan number plates parked here are a good omen that both the prices and fashion on offer are right.